True random number generators (TRNGs) are crucial to the implementations of cryptographic algorithms and protocols. 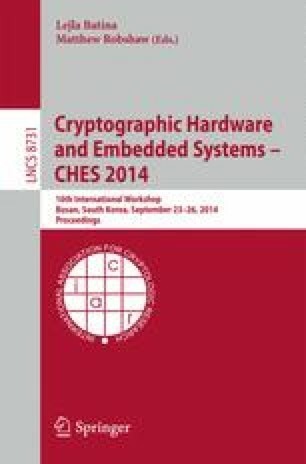 The quality of randomness directly influences the security of cryptographic systems. Oscillator-based sampling is popular in the design of TRNGs due to its nice properties of elegant structure and high speed. However, the credibility of randomness generated from high-speed oscillator-based TRNGs, especially ring oscillator-based (RO-based) ones, is still in controversy. This is mainly because pseudo-randomness is hardly distinguished from true randomness and RO-based TRNGs are susceptible to external perturbations. In this paper, we present a stochastic model to evaluate the entropy of oscillator-based TRNGs, and then deduce the requirement of design parameters (including the sampling interval) for sufficient entropy per random bit, i.e., to ensure true randomness. Furthermore, we design a jitter measuring circuit to verify the theory, and the theoretical results are confirmed by both the simulation and practical experiments. Finally, we apply the stochastic model to analyze the effect of deterministic perturbations, and demonstrate that the randomness of RO-based TRNGs (under deterministic perturbations) can be overestimated and predicting the “random” bits could be possible.